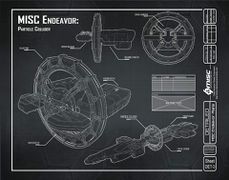 The MISC Endeavor-class research vessel is a fully modular space platform designed to be adapted for a variety of scientific and medical tasks. Initially developed as a floating laboratory, the MISC Endeavor can be outfitted for everything from spatial telescopy to use as mobile hospital. 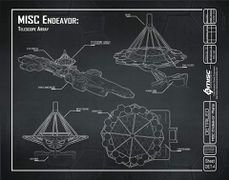 The MISC Endeavor is the company’s most prestigious ship: a dedicated research platform capable of carrying a dozen different space science packages, running the gamut from advanced long-range scanners for jump point identification to additional shielding for near-stellar corona research. Externally, the Endeavor is dotted with sensor hardpoints; internally, the main compartment is centered on a large research laboratory which can be configured for use by a wide range of scientific disciplines. 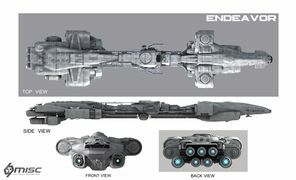 The Endeavor’s main compartment is modular, allowing an alternate configuration as a Hope-class floating hospital. This variant is employed by the UEE and other organizations as battlefield support, capable of getting Marines and pilots back to the battle as quickly as possible! When outfitted as a hospital, the Endeavor’s docking bay is capable of maintaining a single Cutlass Red ambulance. The Endeavor has also found its way into the service of less reputable organizations, where it can has been modified for everything from narcotics production to black market surgery. 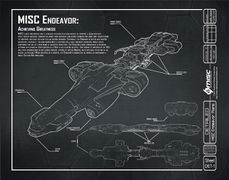 The MISC Endeavor is one of the most unique ships in the Star Citizen universe and the ultimate embodiment of the game’s guiding philosophy to allow players the freedom to choose their own path. Its signature feature is a modular architecture that allows for an unprecedented level of customization of the base functionality, allowing the ship to fulfill any of a variety of different roles. The ability of an authorized dealer to promptly retrofit any of the three attachment points for a nominal surcharge means that owners will have the flexibility to quickly and cost effectively make large, sweeping changes to the core functionality of their ship, and thus much more easily shift from one occupation to another as often as they desire. 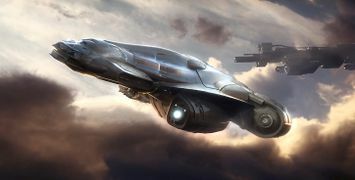 A post outlining scientific basics for Star Citizen, and the usage of the various Endeavor modules was released at the same time as the Concept Sale. Three Q&As were also posted over the week of the concept sale. 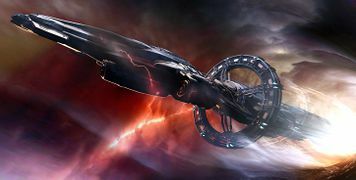 "The Endeavor is not a combat ship, it's a science ship! We intentionally kept the weapons very limited. It's not an explorer either. It's a ship that goes to safer areas and does science. [...] it's entirely possible that we get additional point defense turrets. It's going to wait until we go into the white boxing/grey boxing stage." The Endeavor features a modular symmetrical grid layout with 6 slots, allowing up to three 2x1 modules, or a 2x2 module with a 2x1 module to be installed. No 3x2 module currently exists. Nine modules were available for purchase during the original concept sale. You cannot install more modules than the grid space allows, regardless of how many you own. Module spots are not pre-determined. Modules can fit anywhere on the 3×2 grid not blocked by another module. For an example of this: the Olympic mounts two sets of biodome pairs; the domes are pretty large and the reason you can’t mount three is that the space that a third would need is crowded out by the other two. You could mount a different 2×1 between the Bio-Dome modules as long as it’s one that has a small footprint. All descriptions & prices are taken from the concept sale. As long as Humanity expands outward into the galaxy, there will always be a need for the most basic elements that sustain it. The Endeavor’s biodome pods were designed to support ongoing agriculture operations, adapting and growing foodstuffs which can then be sold for a profit. The Organics Module allows for various forms of plant life to be grown in a tightly controlled environment and harvested for profit. The basic requirements for farming are soil, fertilizer, seeds, and water, all of which can be purchased at garden supply stores that will be located in most major landing zones or, in some cases, mined or otherwise extracted from the environment. 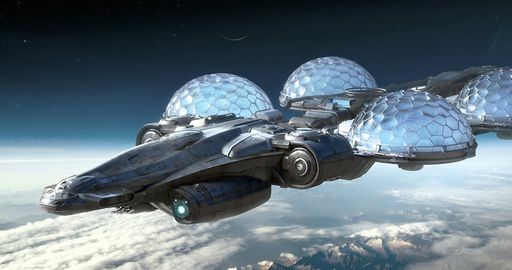 An Organics Module consists of two Biodomes, each of which consists of multiple discrete sections – gardening beds – where different species can be planted. Each section has growth lights above it, and a command console that allows the type and quantity of radiation to be specified and the application therefore automated. The temperature of a Biodome – but not the individual sections – can be specified, so if multiple species are grown alongside one another it’s best to ensure that they have similar tolerances with regard to temperature. The application of water, fertilizer, and the harvesting of the plants is done manually. A productive farmer that focuses on the basics will often be able to earn a solid living, but the most profitable opportunities in this field will revolve around figuring out how to grow more exotic species that are notoriously difficult to reproduce, but for which there is high demand and very limited supply. Attaining such mastery will not come easily or cheaply, as short of procuring the elusive and expensive seeds oneself the repeated trial-and-error sessions that will be necessary will cost a small fortune. Some species might respond favorably to being bathed in a star’s corona, which would tax the shielding of a ship to its limit, and others to the soft glow of a nebula, which would likely attract others that would seek to control such a valuable piece of real estate. Two major advantages of farming on a ship as opposed to a planet are that you can much more effectively adjust your plan given the current economic environment, and you can overlap your growth and delivery efforts. A farmer interested in maximizing profits as opposed to minimizing effort would procure their seeds and other required materials wherever they’re cheapest, and then grow those crops while traveling towards the intended marketplace. Further, some of the most exotic seeds – those that will generate the most lucrative crops – may only be found on remote planets, and may need to be planted fairly quickly if they’re to remain viable. From the moment Humans first looked to the sky, we have dreamed of learning what lies beyond the stars. The optional telescope array turns the Endeavor into an extremely powerful mobile stellar observatory, with an array of instrumentation that allows crews to gather data from the depths of space itself. This data, useful for everything from standard nav studies to jump point discovery, can then fetch a premium on the open market. The Discovery Module is geared towards the aspiring astronomer. It contains a powerful 16-meter telescope mounted on a rotatable base that is capable of scanning the Heavens in the infrared, visible, and gamma spectra as well as dual ejection ports for an array of long-range probes. Wayward comets, asteroids fields rich in valuable ore, derelict ships worth a fortune to a salvager, and primordial black holes that are the Holy Grail of scientific research are just a few of the things that a patient observer might eventually discover. Detection of something of interest typically consists of selecting an area of the sky and slowly searching for anomalies. An object that appears to be nothing more than another in a dense sea of stars might eventually reveal itself to be something different via its ever-so-gradual motion against the static backdrop. Alternatively, an object might emit a radiation signature that suggests something out of the ordinary, or in the case of a large field of asteroids its most detectable aspect might be the fact that it blocks a portion of a background star’s radiation, which might be noticed by the slight twinkling it imparts upon the light from that particular star. The Endeavor’s telescope is one of the most valuable abilities a Discoverer can learn. When coupled with a methodical approach to analyzing a volume of space, a regular stream of discoveries – and a steady source of income – is all but assured. Information can then be shared with other players or sold to an information broker. The most visually unique Endeavor module, the distinct circular supercollider is actually only one small piece of a more elaborate overclocking facility. This large module includes a pair of ‘white room’ workbench labs ideal for tweaking and overclocking starship components. Enthusiasts and professionals seeking to push their weapons, thrusters or other upgrades to the limit can do so with atomic precision thanks to the attached accelerator that allows for safe testing of new theoretical limits; raising the bar on component performance as high as possible. The Service Equipment & Crew Enclosure (SEACE) adds additional crew facilities to the Endeavor, allowing the Workshop module to function as a stand-alone installation for longer missions or for the overall ship to support additional crew in general. The General Research Pod (GRP) is intended as a multi-use facility that can support a variety of active scientific pursuits: microscopy, zero gravity experiments, biological studies and the like. With internal slots for precision scanners, sample and specimen collections, spectrometers and chemical analyzer, the GRP is capable of cataloging new experimental data as well as producing cutting edge compounds. The General Science Pod (GSP) is the Endeavor’s ‘analytic’ module, with installation points for a variety of scientific computers and databanks. The GSP is oriented towards inward-facing processing of data gathered elsewhere, featuring extensive systems for turning the raw information gathered by the GRP and Telescope Array into valuable data for sale or trade. Also known as the Standard Cargo Pod. The Endeavor Fuel Pod takes up a minimal amount of space to add additional fuel for long-duration missions. Effectively a large ‘drop tank’, the Fuel Pod is typically used by Endeavor crews venturing further into the unknown. The Fuel-Pods would not be able to double-up as cargo, but they could store other in-flight consumables like battery packs or ammunition in certain configurations. The Medical Module outfits an Endeavor with all of the equipment necessary to heal any injury or cure any illness that one might encounter while traveling from world to world. That alone guarantees that an enterprising player maintaining a presence in a popular area of space ignored by other Endeavors will see a brisk demand for their services. Medical Modules, however, fulfill an even more fundamental role within the service ecosystem – they act as remote spawn points for both players and some smaller ships. When a player dies, they have the option of respawning at any landing zone equipped with a hospital for a minimal charge. 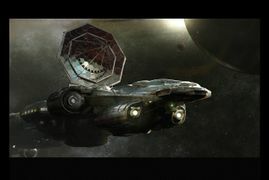 Alternatively, one may inspect the prices being offered by all nearby Endeavors equipped with a Medical Module that have activated their ID Beacons to determine whether a remote spawn into that ship – a concept that will often allow you to get back into the action a lot faster – is warranted. After a player has respawned into the hospital section of an Endeavor, they are granted access to a waiting room where they’re able to order any of several smaller ships that will fit within the Medical Module’s Hangar Bay. The Endeavor’s owner has to pay a premium for the rapid and remote delivery of such ships, and in turn is able to dictate the amount of profit that they require. Upon arrival of the ship, the respawned player – and any of their party members that are also residing within the waiting room – may enter the Hangar Bay, board the new ship, and continue on their way. Most organizations will want at least one Endeavor in their armada, and will want to keep it nearby – but at a safe distance – when combat looms. The Medical Bay Pod is a large set of attached rooms which operate effectively as a standing hospital, complete with operating theaters, recovery rooms and more. The Endeavor’s medical bay is intended to operate alongside the optional Landing Bay, ferrying patients from battlefields and disasters for treatment and recovery. The Landing Bay Pod slings a single, large hangar underneath the spacecraft and attaches it directly to other laboratory pods. Intended to support hospital operations, the landing bay has room to support multiple Cutlass Red ambulances and features complete decontamination facilities. Note that while the landing bay was designed to support ambulance operations, it also functions alongside standard science modules and can support the upkeep any sufficiently small spacecraft. The Landing Bay offers a fairly spacious 30m x 60m x 10m volume of space to work with. Allowed to safely store/transport/launch/refit up to 4 ships that fit inside this space. A Cutlass Red and a pair of 300’s, a couple of Hornets or Avengers, you should absolutely have some good choices to make in terms of what you carry along. It would be possible to install optional Cargo-locking plates to the Landing Bay and use some of the space for hauling. Overall, you’d be able to add roughly 4500 additional SCU of cargo to the ship if you used half of the available space in the Landing Bay (with the remaining space being used to enable a Cutlass to land/take-off with that cargo.) The pilot may depressurize the bay at any time, which will blow any ships or players contained within it back out into space. This would typically only be done to clear out another player actively trying to cause problems by refusing to leave. On top of the individual modules and base ship being sold, the endeavor was also offered in pre-configured sets. These sets have a discount applied compared to buying the modules separately. For a full gallery, see :Category:Endeavor Images.